Hard to believe 2016 is almost over, huh? A whole lot happened this year, good and bad, and it's just flown by. But there's still a big day left in 2016: Christmas! As sort of a half-joke, Die Hard is touted as a popular Christmas movie in the US. So to get in the spirit of the season, we're looking at a Die Hard game this time! 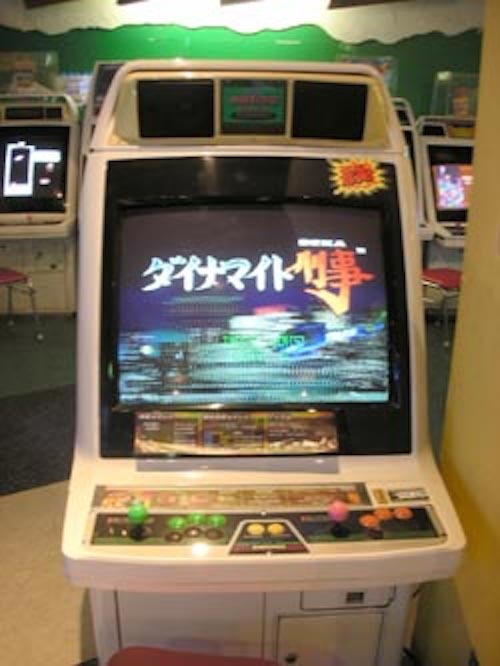 Specifically, the Sega Saturn game "Die Hard Arcade", and it's Japanese counterpart "ダイナマイト刑事 " (dainamaito deka, "Dynamite Cop"). Whoops, guess that kinda spoils a big difference in the games already! 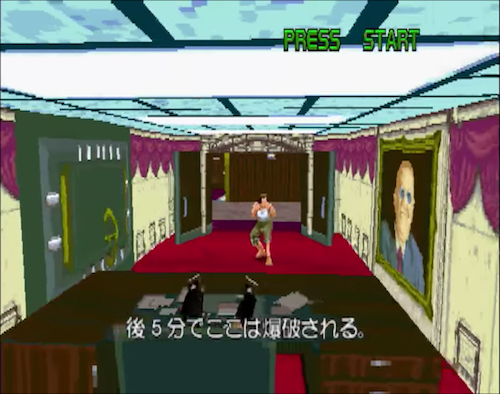 Die Hard Arcade was released in arcade form by Sega in late 1996, with the Japanese Saturn port following soon after in January 1997. A month after that, the US Saturn port of Die Hard Arcade came out. "Die Hard" itself is an action movie from 1998. I'm assuming most of you are familiar, but just in case, let's give a quick rundown of the plot. It's basically about a cop visiting his wife's work for a Christmas party, which then gets taken over by a band of terrorists, and he has to take them on all by himself. The story of ダイナマイト刑事 is close enough to Die Hard that you can tell it was taking heavy influence from it from the beginning. Apparently, they weren't able to get the licensing for the movie until very late in development, leading to the Japanese version not having the Die Hard branding. The game itself is a 3D beat-em-up, and the Japanese and US releases of both the arcade and Saturn versions are all essentially the same game. 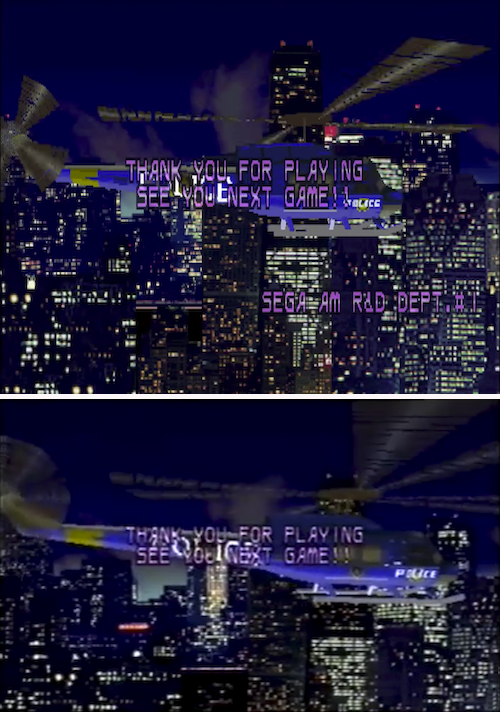 In 1998 a sequel was released for the Sega Dreamcast, called ダイナマイト刑事2 (dainamaito deka 2, Dynamite Cop 2) in Japan and simply Dynamite Cop in the US. As usual, the title logo is of course different. Personally, I feel like the Japanese logo matches the feel of the game a little better - the weird cursive font for "Arcade" seems particularly out-of-place. 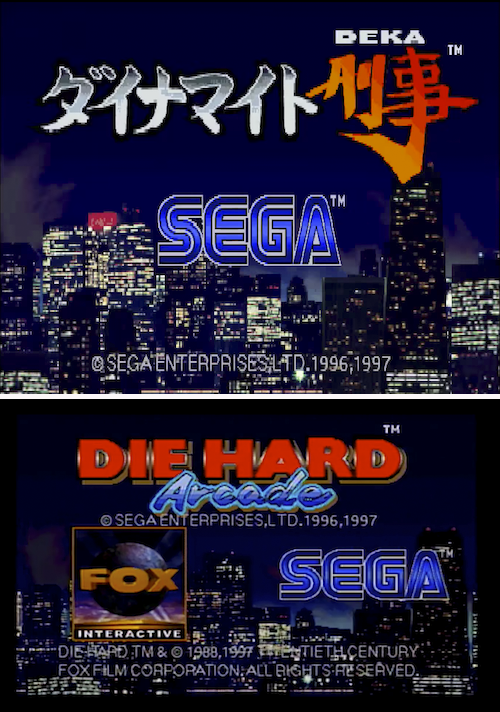 The US title screen also, of course, has Fox logos and copyright information for the Die Hard property added. 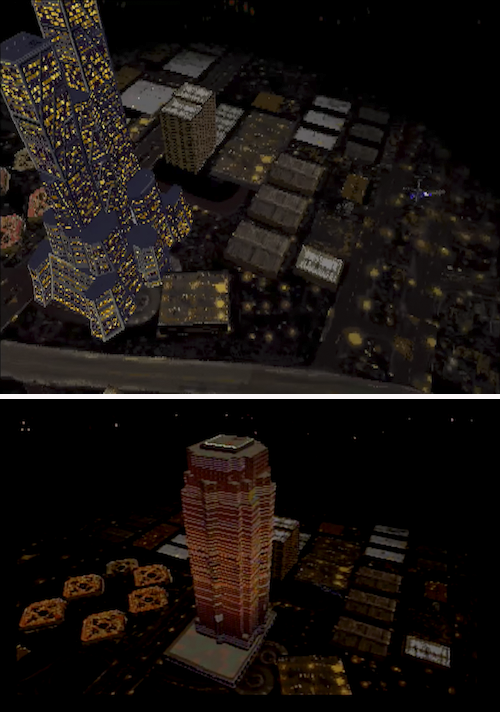 The building the game takes place in shows up during the opening demo and other points, and is completely different between the Japanese and US versions. It seems that they couldn't even use an approximation of the Nakatomi Plaza building without the licensing rights for the movie! There are a few short cutscenes in the game to tell what little story there is. 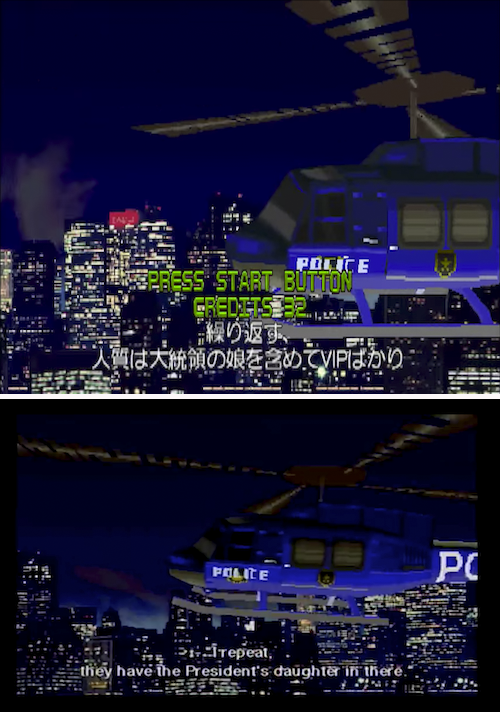 In both versions, the voices are in English, with Japanese subtitles in the Japanese version. First, let's take a look at the game's opening. 繰り返す、人質は大統領の娘を含めてVIPばかり Roger, we've got a bad situation down there. We've got a band of terrorists that have seized control of the building. They're holding 30 hostages inside, including the President's daughter. I repeat, they have the President's daughter in there. We'll have to get her out as soon as possible. Over. It's basically the same setup, but there are a few small differences. The Japanese version specifically says that all of the hostages are "VIPs", and specifies that they were having a party. Interestingly, the last line of the opening doesn't have any subtitles for the Japanese version. Also, in case you didn't know, there's nothing about a President's daughter in the original Die Hard movie. さっさと探せ！！わかったな！」 Fang: WI don't care about the SWAT members! Where is the President's daughter?! Find her and bring her to me." A tiny difference, but the Japanese subtitles simply say "Find her, got it?! ", rather than specifically "bring her to me". ウルフ「小娘がぁ。」 Daughter: "Someone help me! I'm hiding in the president's office. Someone help me..."
Fang: "Aah, so the cat has found the mouse." This scene happens after the President's daughter finds a radio, and apparently gives her location away to the bad guys by using it. "The cat has found the mouse" makes enough sense, but isn't a phrase I've ever heard before in English. Presumably Fang is the cat and the President's daughter is the mouse. The Japanese is a lot simpler, with Fang basically just saying "That little brat...". だがおまえのケリはワシがつける。」 Fang: "So there you are. You got here just in time! This whole building will explode in 5 minutes. But you won't live to see it anyway! Ha-ha-ha." There's an interesting thing going on here - the Japanese says "Took you a while!" instead of "You got here just in time! ", which is essentially the opposite meaning but ends up carrying a pretty similar nuance. Fang also uses the word "ケリ" (keri) in the Japanese version, which is apparently an uncommon way of saying "end" (as in, "But I'll be the one to put an end to you."). I didn't notice this at first myself, but the Japanese version has a little byline of "Sega AM R&D Dept.#1" on this screen. None of the rest of the credits are any different, so it's quite strange that they removed this one bit of text. The section headings in Japanese are pretty straightforward: "Controls", "Gameplay", etc. Nowhere near as creative as the English ones. Also I just want to point out that the Japanese manual is in full color, while the English manual is black & white. The Japanese story is a completely original, and not really anything to do with Die Hard. The English story is pretty close to the movie, with a few little changes to match the content of the game. The biggest difference is, as I mentioned before, the addition of the President's daughter being one of the hostages. The Japanese manual has a lot of extra background story flavor text! I didn't mention it before, but the game also includes a port of "Deep Scan", a very old Sega arcade game. Deep Scan wasn't exactly a big hit in the US, so we just get a line about "memories of video games of years past", rather than the detailed retrospective in the Japanese manual. This section is pretty bare-bones in the English version of the manual - just has the basics, and none of the details the Japanese manual has. It's also interesting that they changed screenshots for the explanation image even though the explanations themselves are basically the same. In the Japanese manual, it explains moves directly with the button names - "A A A B", etc. The English manual instead chooses to go by the moves themselves: P for punch, K for kick. Incidentally, the move names themselves are pretty much the same between the versions, but the English manual doesn't have the detailed descriptions of the Japanese one. The コショウ (koshou, black pepper) weapon isn't listed in the English manual, and the stick and knife-type weapon sections are completely missing. Most of the descriptions are cut down significantly for the English manual - especially the section for healing items. The Japanese manual also has an extra section warning you that if you take damage, you'll drop items. 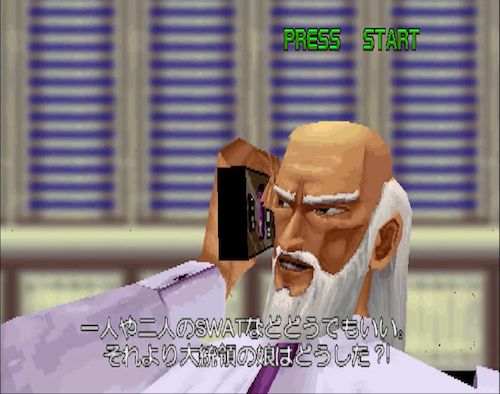 In the Japanese version, the main character is named Bruno Dillinger; "Bruno" may be a reference to "Bruce" Willis. 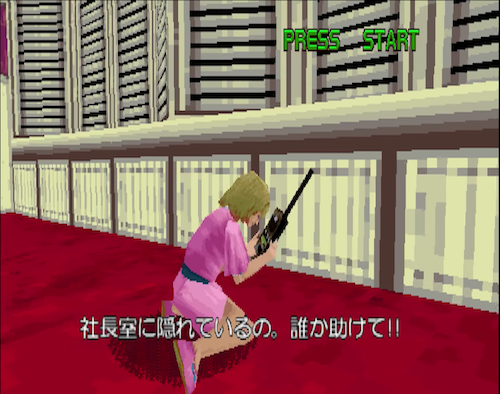 The other characters, called Cindy Holiday and Wolf Hongou in the Japanese version, aren't related to Die Hard at all, so it's strange that they changed those names for the US version. The Japanese manual also notes that White Fang/Wolf Hongou's name is actually an alias. The Presiden't daughter doesn't get a character profile, but elsewhere in the manual she's called Missie Harrington - again changed from the Japanese's Caroline Yoko Powell. Like previous sections, the Japanese character profiles are much more detailed than those in the English manual. To be fair though, the English manual might be being sparse to avoid straying too much from the Die Hard story. Interestingly, this section has a more interesting heading in Japanese ("Chief McGuire's Advice") than it does in English. The tips themselves are different too - both of them do have a tip about arresting enemies, but the other tips are different for each. In the Japanese manual, it tells you about a special dodge you can use when you're in a pinch by pressing A B and C at the same time, and warns you not to get too close to enemies when approaching head-on. There's not really a lot to say here, obviously they're going to be quite different, just wanted to show them both. Personally, I feel like the guy on the Japanese cover looks a lot more like Bruce Willis than the one on the US cover, haha. Here's an Expendables 2 remix from OZIGIRI - Bruce Willis's role in the movie pays tribute to his Die Hard days! ALLKORE FILM FESTIVAL 〜映画館レイブ〜 is available on CD and digitally now! What Christmas movies do you guys like? I've been meaning to watch Merry Christmas, Mr. Lawrence, since it's pretty well-known here in Japan. Writing this article has made me want to watch Die Hard again too, though! Hope you all have a great holiday season, see you next time!